Come and make a joyful noise for the 84th Anniversary of the Great Coronation of Emperor Haile Selassie I and Empress Menen I which took place on November 2nd 1930 in Addis Ababa, Ethiopia. 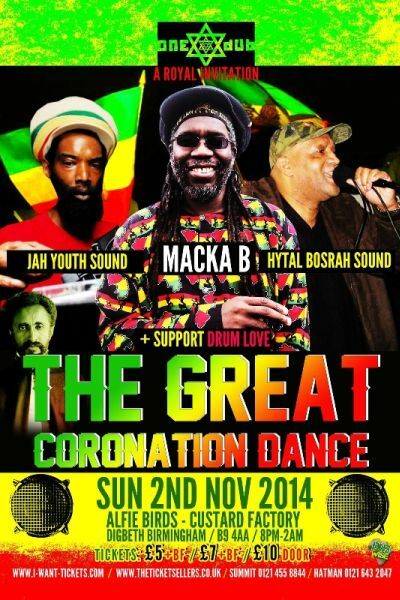 ONEDUB brings to Birmingham a most blessed line up featuring International Roots Reggae Artist Macka B and 2 Heavyweight Rootical Dub Sound Systems, JAH YOUTH & HYTAL BOSRAH featuring Lioness Fonts, Prince Livijah & Izyah Davis. A musical and spiritual occasion for all nations and generations.